3. Press a memory button (1 or 2). - You will hear the beep, and the indicator light will blink. 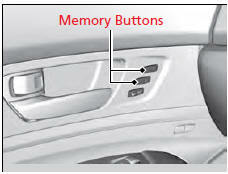 The seat, the steering wheel and the door mirrors will automatically move to the memorized positions. When it has finished moving, you will hear the beep, and the indicator light stays on. • Press the SET button, or a memory button (1 or 2). • Adjust the seat, the steering wheel or the door mirror position.